#34 Squadron was formed on October 29, 1941. From the formation of the squadron until the end of World War 2 #34 Squadron paraded from Scott Collegiate High School here in Regina. After the end of the war, the squadron moved to the Regina Armoury, where it remains today. Shortly after moving to the Armoury, the squadron took on the name #34 Sabre Squadron in honour of the RCAF’s F86 “Sabre” jet fighter. 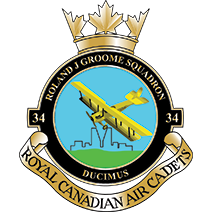 In 2008, the Regina Airport Authority came on as a corporate sponsor to the squadron and the squadron changed it’s name to #34 Roland J. Groome Squadron, in honour of local pilot Roland John Groome who held several firsts in the field of aviation and brought Regina to national attention with his aeronautical achievements. View more history of the squadron here! Currently the squadron is ~90 cadets strong, and in the past numbers have fluctuated between 40 cadets and 140 cadets.